Here’s a first look at the latest Ride of the Week, the 2014 Toyota Tundra 4×4 Limited CrewMax. I’ve had an opportunity to drive several Tundra models lately, including the 2013 Tundra that was the Ride of the Week back in July. 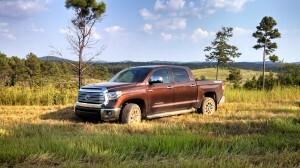 But for the 2014 model year, Tundra is redesigned inside and out – although platform and powertrains remain unchanged – and a pair of new top-trim models have been introduced. East-coast automotive journalists had a chance to preview the new model range recently at the scenic Barnsley Gardens here in Georgia. We experienced off-road and on-road driving in both the new Tundra and the 2014 Toyota 4Runner. 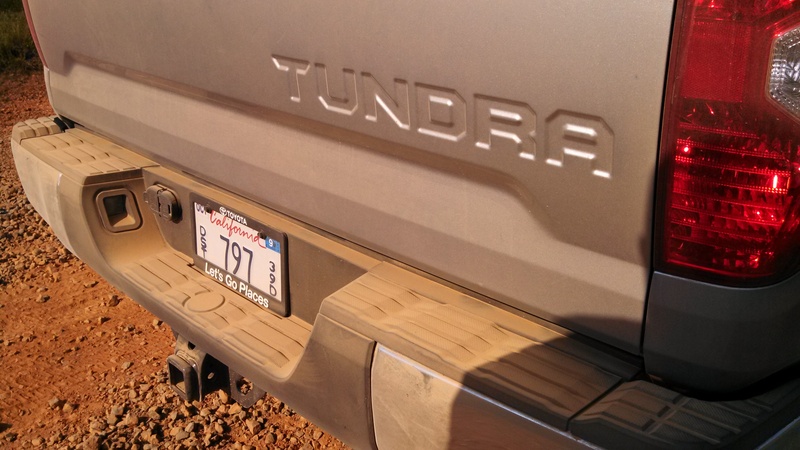 We also sampled towing in the Tundra, which is the only full-size pickup to meet the rigorous SAE J2807 standards. I tested a panic stop from about 35 mph while pulling an Airstream trailer and was impressed with the Tundra’s brakes and handling under load. The off-road driving was a blast in both the Tundra and the 4Runner, both of which are capable in the loose stuff. The 4Runner is unsurprisingly more nimble and a bit firmer, but the Tundra certainly did the job without drama. We didn’t crawl any technical trails, instead ripping around a gravel circuit with plenty of elevation changes and tight turns. Check out a video of the 4Runner in action here. 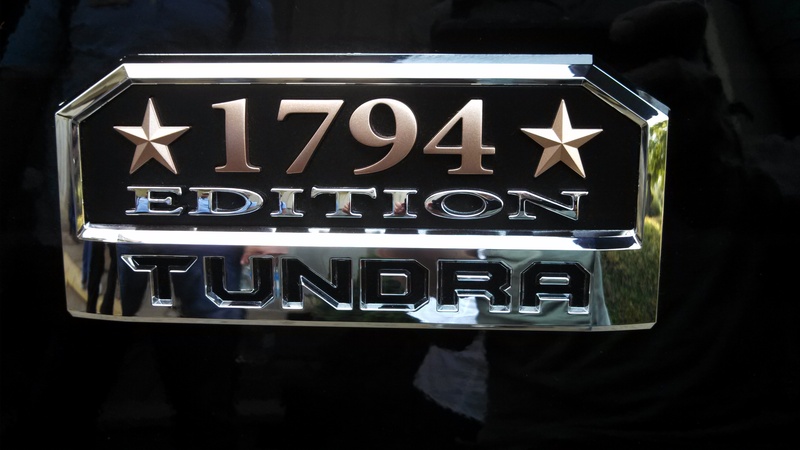 The base motor for the 2014 Tundra is a 4.0-liter V6, and Toyota offers a 4.6-liter V8 and 5.7-liter V8 as well. The V6 gets a 5-speed automatic, while both V8s come with a 6-speed automatic transmission. Both 4×2 and 4×4 drivetrains are available. Toyota offers the Tundra in three cab configurations: regular cab, extended Double Cab and the very spacious CrewMax. For the new model year, five trim lines are offered. The SR is the base model, followed by the more richly equipped SR5. The Limited remains, but is no longer the top-trim. Instead, it’s been replaced by the Platinum and 1794 at the top of the range. Although similarly equipped in terms features, the Platinum and 1794 are stylistically different. For its exterior, the Platinum has color-keyed bumpers and machined aluminum wheels with dark-finished pockets. 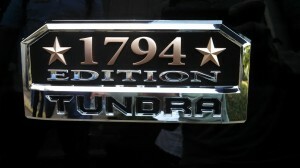 The Tundra 1794 wears more chrome on its exterior, including on its bumpers and wheels. Inside, the Tundra Platinum sports premium leather stitched in a diamond pattern, along with chrome interior trim. The Tundra 1794 instead gets saddle leather. Both top-trim trucks get luxury-grade features like ventilated seats and navigation. The test truck, just like the last, 2013 Tundra Ride of the Week, is the Limited. On top of its $41,895 price, this example includes optional equipment like the Limited Premium package, Entune Premium JBL audio with navigation, a sunroof and a bedliner and running boards. Including destination charge, it’s priced at $45,911. This weekend, we’ll hit the hills in this new Tundra for a family camping trip. My five-year-old twins have never slept in the woods before, so if all hell breaks loose, the huge rear seat in the Tundra CrewMax may come in handy.